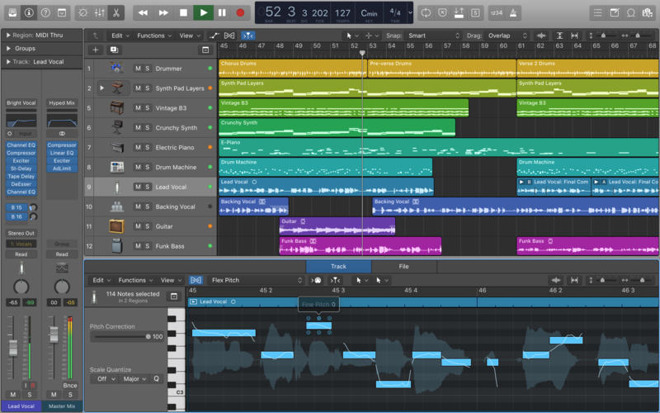 Apple on Tuesday released a new version of its digital audio workstation, Logic Pro X, making some minor feature additions while simultaneously solving two glitches with regions. The 10.3.1 update copes with regions behaving "unexpectedly" when moving them, as well as being deleted from inactive Track Alternatives —branching arrangements users can create within a single song. In terms of features, global edits that cut or insert time will now also be applied to inactive Track Alternatives. Meanwhile, project sharing with GarageBand for iOS has been made more flexible, allowing projects to be uploaded using sample rates other than the standard 44.1 kilohertz. Both Track Alternatives and iOS sharing were introduced just a month ago with Logic Pro X 10.3. The same update also brought things like Touch Bar support, including instruments like drum pads and keyboards. The iOS sharing means that a Logic project can be uploaded to iCloud in a GarageBand-ready version, edited on an iPhone or iPad, and then synced back to a Mac. The latest Logic Pro X patch is free for existing owners. New the software costs $199.99, and requires OS X 10.11 or later.